Schallert, Edwin (March 25, 1953). "Big-Game Hunter Brings African Film; Top Heavy Goes to Adam Williams". Los Angeles Times. p. 25. Childress, Fred (October 30, 1953). "Direction Adds Tense Excitement To 'Big Heat' on Palace Screen". Youngstown Vindicator. p. 14. "Actor 'Rocketing' Up". The Miami News. July 26, 1958. p. 7A. Adam Williams, one of the industry's fastest-rising actors, portrays a rocket expert in Paramount's "The Space Children." "Victor Jory 'Shot' by Western Actor". Los Angeles Times. November 11, 1961. p. 19. Observers said a gun in the hands of actor Adam Williams discharged accidentally at a range of 6 in., inflicting powder burns. ^ Lentz, Harris M. III (2007). Obituaries in the Performing Arts, 2006. McFarland & Company, Inc. ISBN 978-0-7864-2933-2. Retrieved September 7, 2018. ^ "Adam William Berg: Awards". valor.militarytimes.com. Retrieved September 7, 2018. ^ Cruz, Gilbert (October 2, 2009). 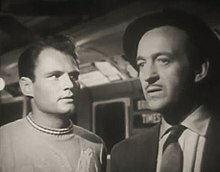 "The Hitch Hiker (1960)". TIME. Retrieved September 7, 2018.